At E3 this year the new Super smash brother game was announced. This announcement among all others made my heart jump for joy! Sure Ps4 and X1 took the spotlight away from nintendo this year,but hell Nintendo was comfortable standing back and letting their release lineup do all the talking. 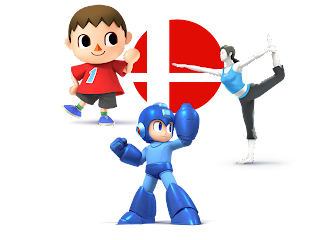 The next Smash bros game is for the 3DS and the Wii-U. I'm very curios to see how it will handle on both consoles and which control scheme the fans will like better. They have introduced at least 3 new characters,one of which I am VERY excited to play as. The chick from Wii fit of all people, And last and the biggest surprise was Megaman. I dont think any one of us saw that coming! after years of hearing people whine about it,the people over at HAL labs finally listened. Since the title is also under the Namco Bandai banner some think they might see one or two cameos from the "Tales of" games or at least some Pacman action. DLC in the works maybe? One of the most exciting things that we've found out so far was the Tripping was REMOVED FROM THE GAME! Which in the majority of player eyes is a godsend.So far Super smash brothers 4 is looking to sell MANY units just like the 3 games before it. I cant wait to get my hands on it much less see what other things will be added or taken out. Yes finally another Super Smash Bros. I have been on the fence about buying the Wii U but with Super Smash Bros and Mario Kart 8 coming out, I just might have to pick one up. Just waiting for another Super Mario Galaxy. 2 Words Leaf......Shieldgido (MVC2) LuL. Someone made a comment that said hes on SSB because he couldn't make it on MVC3 LoL. I'm looking forward to this game! As a smash bros fan, I MUST have it lol. Looks like I may be getting a Wii-U sometime soon.